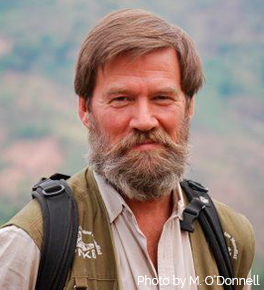 The GRASP-Ian Redmond Conservation Award was established in recognition of great apes advocate Ian Redmond OBE, who has worked tirelessly in support of chimpanzees, gorillas, orangutans and bonobos for more than three decades. Redmond helped create GRASP in 2001, and served as the GRASP Envoy for many years. The GRASP-Ian Redmond Conservation Award was created by approval of the GRASP Executive Committee in 2012. The awards are designed to encourage innovation, inspire leadership, and offer hope in the field of great ape conservation in Africa and Asia. Applicants are judged on the originality of his or her proposal, along with the ability of the proposal to help ensure the long-term survival of great apes. The GRASP-Ian Redmond Conservation Award honours dedicated professionals chosen by a panel of experts. Each winner receives a plaque and a prize of USD $5,000 to support conservation projects.